Summer Storage ideas to personalise your new home! Summer is just peering around the corner, ok that’s not really true, summer may actually be here! We’re just hoping that it’s going to last this year, so let’s be positive and put away any kind of winter clothing you may still have. Coats, cardigans, hats, wellies or woolly socks, they have to go into storage… except where do they go? You’ve got no room in your wardrobe, your cloakroom or under the bed so what can you do? The answer is; get CREATIVE! As a homeowner, you can do what you like in your home. There’s no landlord to ask if it’s ok, you don’t need to ask your parents’ permission like times of old, so there’s no reason not to unleash your inner interior designer. Storage of anything can be a bit of a headache, especially when you move into your new home, so these storage techniques could really benefit you all year around. 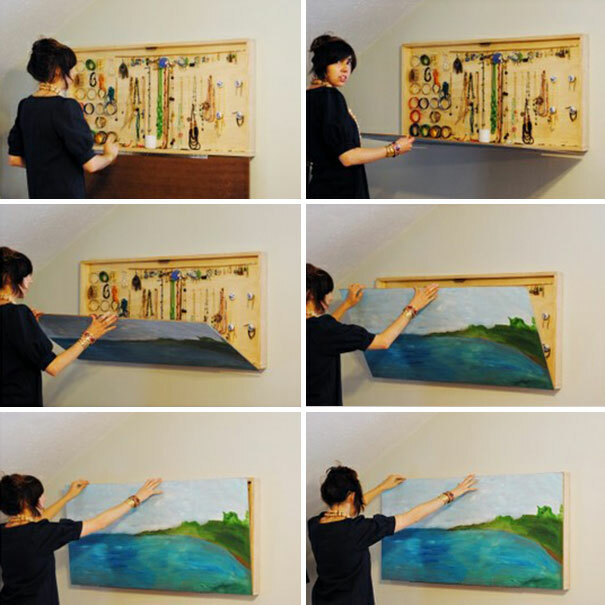 One simple yet effective way to maximise your storage space is to use artwork as a cover for your shelves. We’ve all watched films where the safe is behind the suspicious family portrait, band you could use the same principle! Why not use your wall art as a cover for your jewellery stand like boredpanda.com suggests! 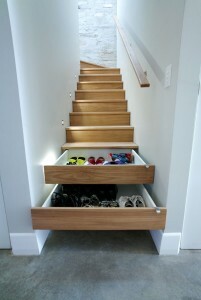 Another sneaky space saver is turning your stairs into drawers. Inspired by yachts and boats where space is at a premium, this simple trick is the perfect way to make sure your new home is decluttered and you’ll never have to ask where your shoes are again! For those armchair lovers out there, this storage solution is screaming your name! 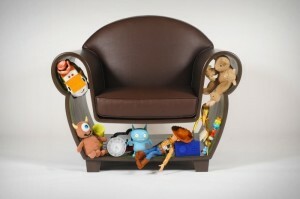 Designed by Judson Beaumont of Straight Line Designs Inc, the hollow arm chair is amazing! Whether you want to put books, DVDs, children’s toys or even wood for the fire underneath, this chair is definitely unique and could save you so much space this summer! As summer is coming, and the BBQ from last year will probably still have ash in it, as well as a few resident spiders, we thought a space saving BBQ would be ideal. 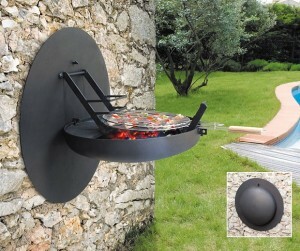 A BBQ that looks like a wall feature but folds down, allowing you to cook your burgers — sounds perfect to us! This space saver comes from www.focus-creation.com and is definitely going to get your friends talking at the next gathering! Whilst these unique space saving ideas are great, your home wouldn’t be complete without a pool table dining table. 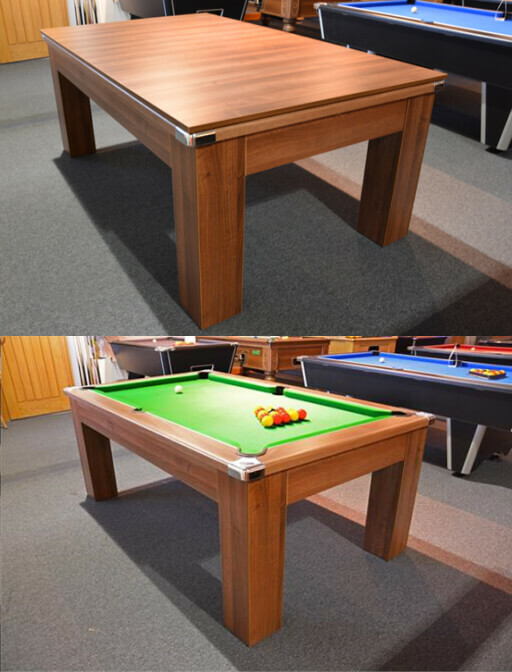 Okay, it’s probably a bit extravagant, but if you need to save space and your pool table is getting in the way, why not cover the top to eat your dinner and then remove it and have a game! www.homeleisuredirect.com can help you achieve a unique finish to your dinner party with the pool dining table. Regardless of how wacky some of these ideas seem, getting creative with your storage solutions makes the whole process a lot more fun. They don’t need to be extravagant or expensive; take some time to think about where in your home you could utilise space and see if you can think of your own creative and maybe even quirky ideas!